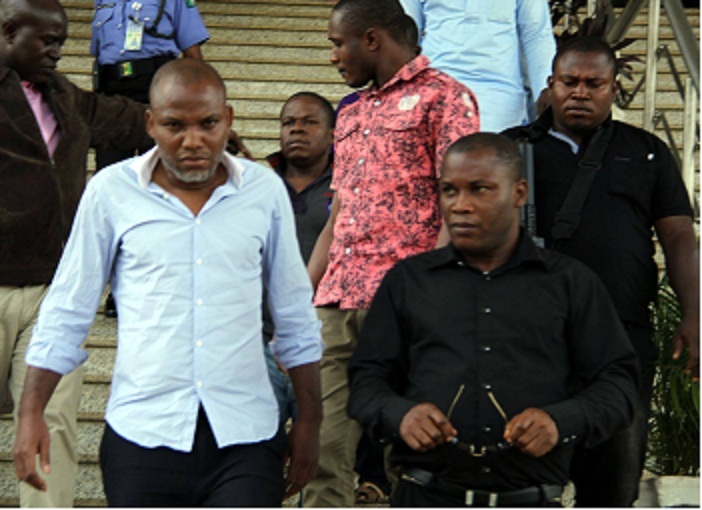 JOKE OF THE CENTURY: RENOUNCE BIAFRA AND BE FREE ---- FG TELLS NNAMDI KANU THE GREAT. Telling the supreme Governor of the church of England, Queen Elizabeth II to renounce Anglican church. Telling the Bishop of Rome, Pope Francis to renounce Catholic church is same as telling the Leader of Indigenous People Of Biafra and Director of Radio Biafra/TV Nnamdi Kanu to renounce Biafra. This joke of renunciation, is the joke of the 21st century and can only be cracked by an illiterate President of Nigeria, Mohammadu Buhari. In the Zoo called Nigeria, no leader is selfless not talk of laying down his life for the people he leads and thus they thought that the Biafrans and every other people are same with them. Nnamdi Kanu, the leader of Indigenous People Of Biafra is a man born with a silver spoon, a man who have everything in abundant, Career, Fame and Riches. But he abandon all these wealth for the love he has for his people, the Biafrans. Before embarking on his conquest of freeing his people, he (Mazi Kanu) traveled to Yisrael where he encounter with the most high, Chukwu Okike Abiama in the Holy Temple, declaring before God to speak the truth always even if it leads to his death. His encounter with the Most High is highly significant in the Biafran struggle. After his anointing in the Holy Temple of Yisrael, he then embark on his heroic conquest, liberating the Biafrans and Africa at large from mental slavery; Fearlessly marching towards Biafra restoration with certain irreversible declaration on Radio Biafra; -- "I am without fear before my enemies, I have sworn an oath to restore Biafra or I die in the process, there will no retreat and no surrender. "If the option they gave to us is to see our restoration by violence, the every living thing living in the Zoo shall be destroyed." Mazi Nnamdi Kanu is the best thing that ever happen to Black race, with him Africa shall never remain the same again, with his sword of truth, he vowed to crush every obstacle on his way, declaring that his mission of raising up Biafran flag must be successful or else heaven and earth shall pass away; -- "It is either the flag of Biafra is raise up or I am lowered into the grave, one of the two must happen. "It is better for this Heaven and this Earth not to exit than Biafra not to come pass. "This very march toward our freedom cannot be hindered, any obstacle on our way, real or imagined, man or woman, adult or child, anything it is, once you are an impediment to the restoration of the sovereign state of Biafra, you will be destroyed completely and totally." He then warn our enemies, the Nigerian government and some Igbo saboteur; -- "We do not forgive, there is no forgiveness in our dictionary, we are here to ensure that the death of over 3.5 million Biafra were not forgotten, it is to them that i own every loyalty and obligation, they are not here to offer any advice or ask us to forgive Gowon and Awolowo." Any same person or government who have listened to the above declaration made before Chukwu Okike Abiama and the entire world on the platform of Radio Biafra by Nnamdi Kanu the Great will know that the Biafra struggle have since crossed it's Rubicon and hence going back or renouncing Biafra is impossible, suicidal and a JOKE OF THE CENTURY. But in Nigeria, their government under Mohammadu Buhari believes every sorts of illusion, their hallucination is unimaginable, no wonder his country is described as a Zoo and his people as Baboons. Nnmadi Kanu the Great is a Hero, A world Figure and an Icon. He is one of the greatest person that ever walk the earth, he is a Messiah to the Biafra and Africa, in fact, in 21st century, he is the greatest man that ever live. Telling such man to renounce Biafra is like telling Queen Elizabeth II to renounce Anglican and Pope Francis renounce Catholicism. And in your (Buhari) wildest dream shall Mazi Nnamdi Kanu, Queen Elizabeth II and Pope Francis renounce Biafra, Anglican and Catholicism respectively. Nigeria government and Buhari should take wise council and release Nnamdi Kanu unconditional and allow BIAFREXIT. If not, they should wait and watch the HEAVEN STRIKE!